224 VALKYRIE compatible Ammo Can Labels Ammunition stickers decals 2pack 3x1.15"
450 BUSHMASTER Ammo Can Labels Ammunition Case stickers decals 2 pack 3"x1.15"
NOTE: Only 1 Ammo Box Included. Stackable design and double padlock tabbed for security; Four tie-down points on side. Features 3 locking options to eliminate prying and tampering (including an exclusive durable steel staple for locking the hasp so the lid cannot be pried open). Base-to-lid interlocking system provides superior stackability and reduces tipping. Turn ammo cans into indestructible safes. Will fit 60mm, 40mm, 20mm and 50 cal. (Ammo can not included). No can modification required! Model Number: AC4C. Manufacturer Part Number AC4C. Product Model AC4C. Manufacturer: MTM. Manufacturer MTM. 7 Easter Court. Item#: 5628951. Trending at $13.73eBay determines this price through a machine learned model of the product's sale prices within the last 90 days. PA108 Military Style. Ammunition NOT Included. Durable steel construction. We manufacture tools designed for the DIY lifestyle. Rust resistant powder coat finish. 1 Year Warranty. Color: Black. Size:12-7/8 inL x 7-1/4 in W x 9 in H.
When you change what's inside, you can easily change the label with these magnetic labels. Model Number: S107435. Manufacturer Part Number S107435. Product Model S107435. Manufacturer: MTM. Manufacturer MTM. 7 Easter Court. The MTM Survivor Ammo Can (SAC) is designed for underground ammo storage and a. sealed lid and protective cap design. Great for stashing: Ammo. The Survivor ammo. 101 other uses. Vapor Corrosion Inhibitor plastic bag to line the ammo can along with Desiccant. X2 5.56 Nato Ammo Labels. The Sheffield 12626 Field Box is a must-have for storing and safely transporting valuables when you're outdoors. The Sheffield 12626 Field Box also features base-to-lid interlocking system that makes it easier to stack and reduces tipping, plus a hefty handle for easy carrying. X4 5.56 Nato Ammo Labels. This listing is for a set of 2 adhesive vinyl labels for your ammo cans or anything else you'd like to stick these on. The come in black, with a green border, and white text. MISC Each label measures 3" wide by 1.15" tall. They are made of premium outdoor vinyl with UV resistant ink so you can use them indoors or outdoors. We have a huge selection of ammo can labels to choose from. See our AMMO CAN category in our store to see our entire selection! If you would like to order a large amount, please contact us to inquire about our 'bulk rate discount'. If you have a caliber that you don't see here, contact us, we can probably custom make it for you. SAC Survivor Ammo Can. Condition is New. Shipped with USPS Parcel Select Ground. They are made of premium outdoor vinyl with UV resistant ink so you can use them indoors or outdoors. We have a huge selection of ammo can labels to choose from. They feature a water resistant tongue and groove lid and corrosion resistant bail latch. 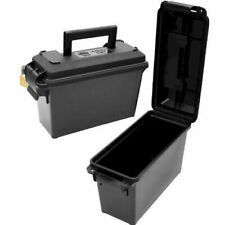 These mini tactical ammo cans are constructed of heavy duty reinforced polypropylene, pre-drilled for padlock safety and are made with a stack-able design.7744. MTM’s AC4C is a Rugged tactical carrying crate for multi-caliber ammo storage and transport. The only problem is, that they are easier to knock over than the larger ammo cans. Now you can stack them as tall as you want in these specialized crates. Trending at $12.72eBay determines this price through a machine learned model of the product's sale prices within the last 90 days. 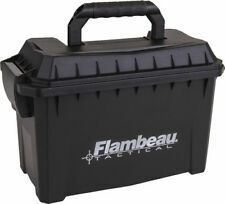 Designed for ammo storage, although perfect for storing shooting, hunting or survival gear. Designed to be stacked high, using molded-in stacking ridges. Utilizing MTM's tongue and groove O-Ring seal system for a superior water-resistant dry storage. 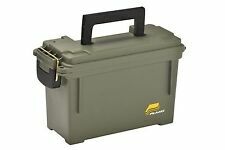 5 out of 5 stars - Large Ammo Crate Utility Box Deep Dry Storage Emergency Gear Holder USA Made . 48 product ratings48 product ratings - Large Ammo Crate Utility Box Deep Dry Storage Emergency Gear Holder USA Made . X2. 45 ACP Ammo Labels. Water Resistant Seal To Keep Ammo Dry! Brand New & Original! Range Gear Ready When You Are! X2. 223 REM Ammo Labels. Model Number:TMC15. When on the go, theMTM Tactical Mag Can is always ready for a quick transport to protect your loaded magazines. Thisammo case manufactured by the experts atMTM shuts tight with an O-ring seal and solid latching system, and each mag is individually secured (in an upright position) with ridged foam padding to prevent bumping, sliding and scratching. Product: 2 Adhesive Vinyl Labels made for your Ammo Cans. These decals will last 7 years outdoors. Bubble Free Adhesive Labels. Qty: 2 Labels per Order. Application: Wet or Dry Apply Self-Adhesive Labels. 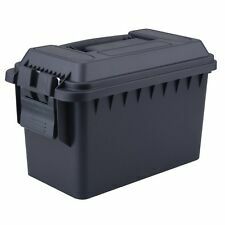 Waterproof Ammo Storage Box Ammunition Case Can Solid Plastic Secure Cases Strong Handle padlock tabbed. Heavy-duty dual latching system makes for a better seal and less likely to open accidentally. 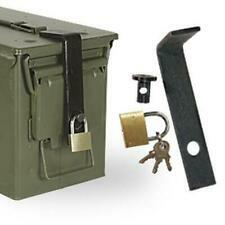 Strong handle Heavy duty cans, designed to be stacked and triple padlock tabbed for security. X2. 22 LR Ammo Labels. X2 12 Gauge Ammo Labels. Manufacturer: PLANO. Manufacturer PLANO. 7 Easter Court. Product Information. Model Number: 1312-00. Manufacturer Part Number 1312-00. Product Model 1312-00. Trending at $15.02eBay determines this price through a machine learned model of the product's sale prices within the last 90 days. X2. 40 S&W Ammo Labels. Holds 6-8 boxes of ammunition. Product Features. MTM ACC45 MTM 45 ACP Ammo Can for 700 rd. Includes 7 each P-100-45's Dark Earth. Model Number: ACC45. Manufacturer Part Number ACC45. Product Model ACC45. MTM MTM 45 ACP Ammo Can for 700 rd. Manufacturer: MTM. X2. 380 ACP Ammo Labels. Product: 2 Adhesive Vinyl Labels made for your Ammo Cans. These decals will last 7 years outdoors. Bubble Free Adhesive Labels. Waterproof & Washable. Material: Premium Vinyl w/ UV Resistant Ink. Wash surface with isopropenyl alcohol. Features water resistant tongue and groove lid and corrosion resistant bail latch with a strong comfortable handle for heavy loads. ammo can is constructed of heavy gauge steel so it will stand up to use and abuse. The Magnum Tactical Plastic Mag Can 12 for 223/5.56 Magazine Storage is designed to hold magazines in precut foam padding. Features molded-in stacking ridges for slip resistant stacking and water resistant tongue and groove lid with corrosion resistant bail latch. Vinyl Ammo Can Magnet label "NRA"
Ammunition cans are metal or plastic cans which can protect and store a variety of dry goods, survival gear, camping gear, or ammo boxes. They were traditionally designed to store ammunition during World War II and can be extremely versatile in a survival situation. The lid commonly features a rubber gasket, which seals moisture out of the compartment in order to help prevent water damage to items inside. What can you use ammunition cans for? How many cartridge boxes can you store inside ammo cans? Most ammo cans may be bought for specific types and caliber sizes of bullets. Some may also feature a label on the side which lists the capacity of cartridges, the caliber size, the site of manufacturing, and a lot number. As a rule of thumb, around 125 12-gauge shotgun shells can fit inside a 12 by 7 by 6-inch can. Can you lock cartridge boxes? Can you store loaded magazines inside an ammo can? Most ammo containers can hold a special military-grade polyethylene foam insert kit that helps store pistol or rifle magazines individually. Each clip is stored bottom-up and divided conveniently to give you easy access. Some of these foam kits may feature a special cutout to hold a small semi-automatic pistol.